The White-necked Conure, or Pyrrhura albipectus, is losing ground to human activity and the wild bird trade. Outcome: The Parrots in Peril team learned that the range for these species is wider than previously thought. This critical work also underlined the importance of Podocarpus National Park for all of the threatened species, the White-breasted Conure (Pyrrhura albipectus), Red-faced Parrot (Hapalopsittaca pyrrhops) and the Golden-plumed Conure (Leptopsittaca branickii). Where found: Found in east slope of Andes in SE Ecuador and N Peru. 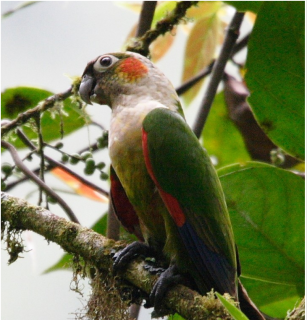 History: The White-necked Conure (Pyrrhura albipectus) is restricted to three areas (Podocarpus National Park, Cordillera de Cutucú and Cordillera del Cóndor) in SE Ecuador but has recently also been found in N Peru. Although it seems to be common in Podocarpus National Park, populations elsewhere are low, with a total of possibly only a few thousand individuals. It has also been spotted as far south as Panguri in Zamora-Chinchipe and in adjacent parts of the Cordillera del Condor in Peru. Ecology: White-necked Conures are found from 900-1700m (2952-5576 ft) in humid forest in upper tropical and subtropical zones, preferring upland forest along waterways, mainly in primary forest but does tolerate some habitat disturbance. They favour flowers of different vines, fruits, and berries in their diet. They are seen in flocks of a dozen or less, but sometimes up to 50, feeding in the upper canopy. They bathe in rockpools or among moss-covered rocks.